The Lake Eyre Basin (Basin) Aboriginal Map is an education resource on the richness, diversity and vibrancy of Aboriginal cultures across the Lake Eyre Basin in a way that honours the desire of Aboriginal people to tell their story. The Basin is one of the world’s largest internally draining systems and covers about 1.2 million square kilometres taking in large parts of South Australia, the Northern Territory and Queensland, and a small part of western New South Wales. The Aboriginal Map provides a pictorial overview of the presence and significance of Aboriginal people in the Basin. 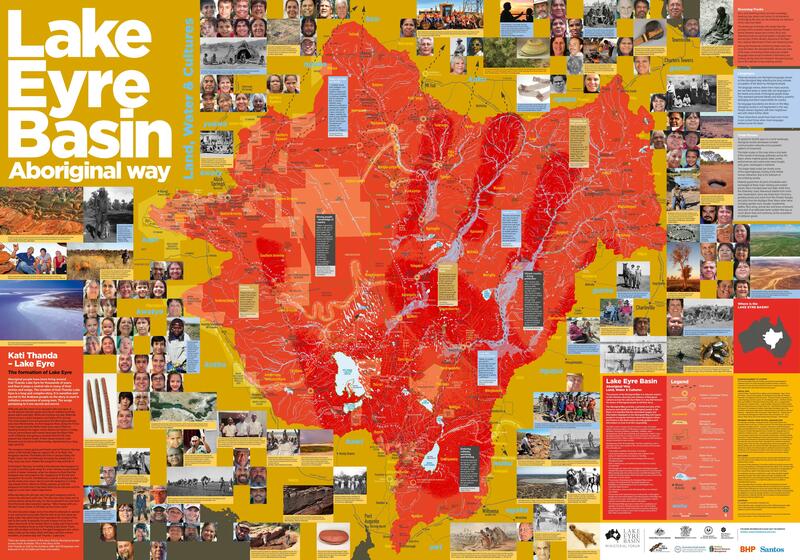 The images and information displayed on the Aboriginal Map will inspire people to recognise and learn about Aboriginal culture and history in the Basin and to improve guidance and information on how to do this respectfully. Please note: the unit price of the Lake Eyre Basin Aboriginal Way map is cost recovery. Update: Dispatch date originally estimated as 'end of August' and has since been updated to 'October'. Contact Us for any queries or concern regarding this information.